Durable enough to endure constant active use while comfortably supporting weights up to 350 lbs. Concorde® boasts contoured molded-foam seat and back cushions, a tubular steel frame and a Perma-Mesh seat suspension system. Asphalt. 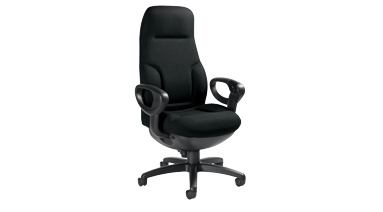 Features push-button controls located in the armrests, height adjustable back, sliding seat depth adjustment, arm width adjustment and multiple position tilt-lock. Lifetime limited warranty. High Back. Silhouette Fabric.